Successful treatment of periprosthetic shoulder fractures depends on the right strategy, starting with a well-structured classification of the fracture. Unfortunately, clinically relevant factors for treatment planning are missing in the pre-existing classifications. Therefore, the aim of the present study was to describe a new specific classification system for periprosthetic shoulder fractures including a structured treatment algorithm for this important fragility fracture issue. 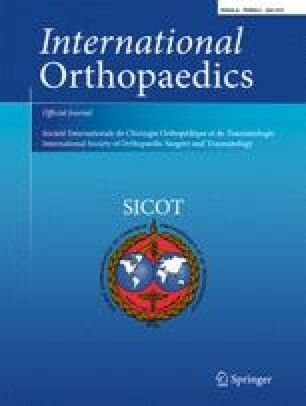 The classification was established, focussing on five relevant items, naming the prosthesis type, the fracture localisation, the rotator cuff status, the anatomical fracture region and the stability of the implant. After considering each single item, the individual treatment concept can be assessed in one last step. To evaluate the introduced classification, a retrospective analysis of pre- and post-operative data of patients, treated with periprosthetic shoulder fractures, was conducted by two board certified trauma surgery consultants. The data of 19 patients (8 male, 11 female) with a mean age of 74 ± five years have been analysed in our study. The suggested treatment algorithm was proven to be reliable, detected by good clinical outcome in 15 of 16 (94%) cases, where the suggested treatment was maintained. Only one case resulted in poor outcome due to post-operative wound infection and had to be revised. The newly developed six-step classification is easy to utilise and extends the pre-existing classification systems in terms of clinically-relevant information. This classification should serve as a simple tool for the surgeon to consider the optimal treatment for his patients. The authors declare that they have no financial or personal conflicts of interests that could have influenced this work.